What a wonderful surprise. 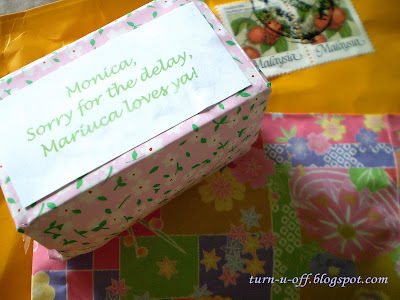 These were sent by a sweet blogging friend, Mariuca! 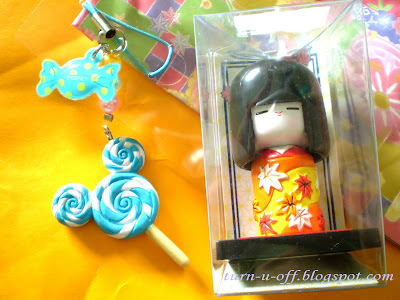 I was touched by her wonderful generosity and for sending me some lovely things from her Tokyo vacation. I LOVE MY LOLLY and DOLLY! "Omiyage" means souvenir in Japanese. Recent blog:=- Joke and Win CASH! Recent blog:=- Just click and play! wohooooo! made it again, at last! He he Ane!!! Ur package is coming soon too, not sure how long it will take to reach u though…..
Blue lolly u mean? Yeah the lollies oso didn come in lime green sigh! I got the lollies at Disney sea he he…. Last minute saw it and happily grabbed hahah! now that's a cute souvenir from Japan.